The Amazon ASIN blocking campaign is not bad news, but massive opportunity! You are here: Home / Categories / Great Business Ideas / Creative Ideas / The Amazon ASIN blocking campaign is not bad news, but massive opportunity! Recently I spent some time on the phone with two of my closest partner advisors to discuss some hot topics that a lot of Amazon sellers are chatting about recently. These “hot topics” include the latest development where Amazon seems to be managing their storage capacity issues in a slightly more restrictive manner known as “ASIN blocking” as well as trends in sourcing the most profitable products to sell on Amazon. Brett Bartlett, runs an 8 figure Amazon FBA (Fulfillment by Amazon) selling business, and Nathan Bailey is the manager who has helped me coach over 1,000 students on their journey to building a successful business online. This call is an unedited recording of our conversation – and I think you’ll get some great ideas from our chat! The bottom line is, there’s nothing but good news for us as sellers in the short and long term, and the ProvenAmazonCourse.com course is the best selling, most up to date and creative course in the world to get you there! Join the chat on Facebook in our 25,000 member seller community. Or leave a comment here on my blog! Do you have restricted ASIN’s in your inventory? Here’s how to find out! In your Amazon Seller Central account run an “inventory health” report (under reports) and one of the columns to the far right is titled “asin-limit.” That column will be blank for nearly all of your products, but if there is a restriction on any of your products it will be shown there! Awesome Jim. Thanks for clarifying things. We are trying to help as many folks as we possibly can with this small issue. We are hearing so many success stories right now – it’s a very exciting time to be a seller on Amazon! Thanks for letting us listen in, Jim, Brett, and Nathan, It’s very appreciated. you are welcome – we are excited to share our perspective! It really does attract a crowd though when you predict bad news on the horizon, so the trend continues. “Diversify” has ALWAYS been good advice and we are leaders in the “multiple income streams” movement for that reason, but Amazon is steady as ever from our vantage point with some great new opportunities on the horizon as more and more shoppers discover the site and use it. Thanks for the great ideas, Jim, Nathan and Brett! Thanks guys for the video. Awesome info as usual! The restricted ASINs is a blessing in disguise in my opinion. we completely agree! Amazon is a “numbers driven” company, and getting to see their instincts on what will sell and what won’t is a HUGE advantage for us as sellers! This is great Jim. Thanks for the reassurance and speaking on solutions about ASIN-Blocking and this business overall. We are here to serve! Thanks for the feedback. Jim, I must say that you always see the positive in every circumstance. Absorbing your content has always helped me move forward. You’re actually the only reason I started selling on Amazon. I listened to a video interview you did with Jason over at makesellgrow.com. I watched that video 11 months ago and since then have made profit from retail arbitrage, online arbitrage, private labeling, and most recently wholesaling. Thanks Jim! Used our ProvenAmazonCourse.com course I take it? We’ve seen some incredible success stories coming from that lately! Thank you, guys, for this outstanding conversation. Timely, deeply informative and respectful of all parties. You touched very lightly on the book category. Some of we newer, leaner booksellers want to understand whether the 8 wk metric applies to used books… since we source one-at-a-time, not in any volume. We’d like to take this opportunity to maximize our inventory’s quality. But it’s still a bit fuzzy as to whether Amazon would apply that same metric to this somewhat different category. Any insights you can share? 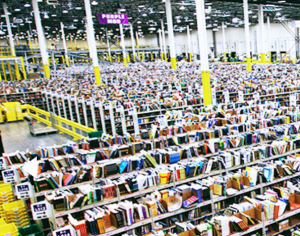 There’s no official word from amazon yet on the extreme long tail of books, but please keep sourcing and selling them! Merchant fulfilled is always a great option! Jim, for many newer and smaller used book sellers, merchant fulfilled isn’t a great option. We don’t have the space or budget to create the space. Furthermore, when we examine the restrictions we don’t see any clear pattern. We don’t see large number of other sellers or the 8-week turn preference… the restrictions we see violate the parameters suggested in your conversation. It’s baffling. We’d go multi-channel but, again, storage space is an issue. Perhaps we’re a small segment, those of us who are still getting our sea legs in FBA used books. The only input from the larger booksellers is that maybe we need to throw in the towel or maybe we’re not cut out for this, which of course isn’t helpful one iota. We’re still searching for the best way forward so— we’ll stay tuned. Me, I’m sticking with my cheapest sources and just not sourcing long tails until we get clearer word. Looking forward to the day we have clearer metrics so we can move forward with reasonable confidence. Thanks again— I’ll stay tuned! Diversify. The more options you have to source, sell, store and create new income streams, the more stable your biz becomes. Creative partnerships resolve all challenges. I can relate to what you’re saying, Linda. I’m getting this message for long tail books that Amazon might only have one or two of, and there’s no way for me to know until after I purchase, and I purchase based on the price I’ll get FBA. Merchant fulfilling won’t work because there are penny sellers merchant fulfilling. If this continues, I’ll need to greatly change my purchasing to only buying things where I can make money FBA or Merchant-fulfilled. It’s an opportunity in the sense that it’s going to force out people who don’t want to mess with it. I’m sorry that the larger booksellers are sounding negative toward the newbies. I know on Jim’s group that is totally not the case. My heart goes out to you. I haven’t run into the restrictions myself with long tail books and I’ve not taken the time to research this as I should. My first few thoughts? Get approved in the antique collectible books category. I imagine that category would be less inclined to restriction for obvious reasons. If it’s a collectible book there aren’t a gazillion moving slowly. They will move slowly but the ASIN would not be considered overstocked because the very essence of collectible means there aren’t tons easily found to be sold and most especially if you challenged the restriction by calling or writing seller central emphasizing that concept. The next thought is to watch rank and listing numbers while scouting. The used book category is a whole other animal in that there are so many books that are worth picking up at such low cost literally everywhere. So if you do find penny books or high rank/many listing books move on to the next forty within your scan area. I hope this helps. We’re in this together. Chin up! Keep plugging away. Thanks guys for sharing the info. You answered a lot of questions I was having. You are talking about the ProvenPerformanceInventory.com course! Get on the waiting list – we’ll relaunch that soon! Right now we are taking care of the last round of students. There’s not a simple report you can pull that tells you this info. It takes research and a process, but there are two new opportunities here. Also -our course sold at ProvenPerformanceInventory.com reveals how we find “gaps” in the Amazon product listings so you can stop hunting for “inventory” and start hunting for “gaps” instead. We do this by experimenting with Amazon paid advertising program using different keywords until we find ones that are producing a lot of search activity, but few matching products using the description. This is not a matter of what’s best for you or what’s best for Amazon ultimately. It’s a matter of what’s best for the Amazon shoppers. That gives me great confidence that Amazon will quickly find a way to ensure that in demand products are made available to the buying public. It serves us all well for those solutions to be introduced! For now, something doesn’t make sense and they are blocking a sku from FBA that you think SHOULD be in FBA I strongly urge you to sell it merchant fulfill and earn their attention. Once it’s moving via MF, you’ll quite likely get the green light to send it to FBA again. It only makes sense that they’d want it in stock! Thanks Jim. Good point, that Amazon would not want to miss out on the FBA fees. Perhaps the algorithm they are using needs adjustment. I trust they will get it straightened out. In the meantime we may try merchant fulfilled on some of them. Thank you for keeping us informed and from a non-hyped perspective. Great Call. Thanks for the quick solutions! Appreciate you Linda – such a creative entrepreneur. Your support and input is priceless to me! People keep complaining about it. They need to learn how to adapt. If Amazon says an item is not selling, why would someone want to send a ton of that item into Amazon? You would think they would want to sell things, that actually sell. Agreed. I do feel for those who rely heavily on long tail items with huge margins and looooong shelf times. Amazon isn’t as excited about that model as they used to be, but that’s only one of many strategies. Another group that might be panicking a bit are those who went against our advice as newbies, bought high end private label courses, and are now stuck with items that amazon doesn’t want. “Slow and steady” really pays. Hi Jim, thanks for your insights once again! I have a question regarding “let Amazon tell us what to buy”. I am not referring to your course “proven performance inventory” though I am dying to get in 🙂 Specifically, I am referring to the current situation. How limited ASIN tells us that? Could you please elaborate a little bit more? Amazon is telling us what products are OVERSTOCKED when they reject an ASIN. That means you’ve hit upon a very popular product and it might make for a great bundle opportunity! That’s what I’m talking about. I can share a little good news this morning. exactly 1 FBA seller. So this isn’t just a long-tail issue. I read Jim’s article this morning, ran the report, and it had nothing but blanks in the asin-limit column. The good news is I just added 3 of those items to a shipment and this time they were accepted. So that’s a relief! I’m about to go out sourcing now so hopefully I’ll be able to ship the rest later. I can feel more confident about sourcing again now. Thanks to Jim, for the article and good luck to all. Good morning. I am looking at my “inventory health” report and for some reason I’m not seeing a column titled “asin-limit”. Any idea as to why or where else I might find it?